After hours of research, reading and culling through an abundance of products and information, we have our top picks for the best dog food storage containers including the overall best item, best dog food can covers, stackable containers, dog treat storage as well as some affordable alternatives. What Is the Best Dog Food Storage Container? Looking for the best dog food storage container? We've reviewed several options below for you to choose from. We all understand that buying dry dog food in bulk is a great way to save a little money, but if it’s not stored properly, it could lose some nutritional value or spoil. If that happens, you’re not saving any money at all, because you’ll be throwing out dog food that could have been used if you had the proper storage tools. * Scroll down to watch our detailed VIDEO REVIEW of the #1 best food storage for dogs pick. I chose the IRIS Airtight Pet Food Container Combo Kit as the best dog food storage product on the market (read my review below on why). This dog food storage container is made for dry kibble, the most common dog food diet, and it is very easy to use. It’s made from durable, BPA free, FDA compliant materials, and – as the name states – it provides an airtight seal. * Please click on the dog food storage for more product details and prices. Alternatively, scroll down to read reviews of each product. What do I know about dog food storage containers? Can a dog food storage container improve my dog’s health? Who should buy dog food storage containers? According to an article in Dog World Magazine , dry dog foods that are packaged and stored could lose up to 50 percent of many vitamins within six months, and those that are exposed to heat or cold could lose even more. Over the past couple of weeks, I have spent countless hours researching the best dog food storage tools. I’ve created this list of products that includes storage for dry kibble, wet food, dog treats and even storage products for traveling with dogs. This research was done online through many different websites, and I’ve collected information from product manufacturers, consumers, and experts in the pet food industry. Selecting the best dog food storage container will depend on the type of dog food you buy. Obviously, if you buy dry dog food in bulk to save on costs over simply purchasing affordable budget dog foods, you’re going to need a dog food container to store the excess kibble in. What about canned food? If you don’t use an entire can in one feeding, you need to store the leftovers properly, even if you’ll be using the rest within 24 hours. Dog treats should be stored properly as well. Chances are, you probably make a bag of dog treats last for several weeks. Depending on the type of treats you buy, they could go bad within a few days if not stored correctly. Dog food storage is not something to take lightly. If not done properly, you’re going to be wasting money, and you could potentially make your dog very sick, even when you buy the best quality dog food. Even the best, most high-quality dog food, when stored incorrectly, can develop bacteria, go rancid, develop mold or become infested with rodents and insects. When looking for the best dog food storage container products, there are three things that they need to protect the food from – air, moisture and extreme temperatures. The IRIS Airtight container seemed to hit all the marks. In case the IRIS Airtight Pet Food Container Combo Kit isn't available, I would recommend taking a look at its similar counterpart – the Gamma2 Select 50 for Pet Food Storage. This container also offers an airtight seal, and it can hold up to 50 pounds of dry dog food. It's on wheels for easy mobility, and it is made with human-food grade plastic. The large opening makes it easy to get to the dog food, and lid secures quickly with the simple latch. This cheap dog food container will keep your dog's food fresh long after you open the bag. It's also a great choice for homes with limited space. I chose the IRIS Airtight Pet Food Container Combo Kit for many reasons, the first of which is its versatility. This kit comes with a large container mounted on 4 free-wheeling casters that make it easy to move around. This container holds upwards of 25 pounds of dog food. There is a smaller container that fits easily on top of the large one that will hold more than 10 pounds of dog food, and it also comes with a measuring scoop. The small container can be used for traveling, as it isn’t secured to the large container at all. As you can see in my video review above, there is a groove around the lid of the large container, so the base of the small container can fit easily inside. If you don’t travel much with your pet, you can use the small container to store doggy treats. It’s just as important to store your dogs’ treats properly as it is to store his extra dog food. The measuring scoop included in this kit has marked lines that indicate the amount for ½ cup, 1 cup, 1 ½ cups and 2 cups. This makes it very easy if your pet is on a diet and you need to measure his food for every meal. It’s also convenient if you have children that like to help care for the family pet. You can simply mark the fill line that is correct for your dog, and your kids can help care for Fido. IRIS made their Airtight Pet Food Container Combo Kit with BPA-free, FDA compliant materials. You can store dog food in this container for long periods of time without having to worry about harmful chemicals leaching into your dog's kibble. I love the attached wheels on this dog food storage container. It makes it so easy to move around. I have no problem lifting 25-35 pounds of dog food, but it’s really nice that I no longer have to. If you need to move the container, you can easily wheel it across the room to where your dog’s dish is located. This is a great option if you want to keep the container in a closet or pantry and only take it out when it’s time to feed your canine companion. As the name suggests, the best thing about this brand is that both the large and small containers are equipped with an airtight seal to keep air, moisture and pests out. It’s also nice that these Airtight Pet Food Containers from IRIS are clear, that way you can easily see when you’re running low on dog food. The simply-designed flip up lids make accessing dog foods fast and simple, and the fact that it's made in the USA is just icing on the cake. These dog food storage containers are so handy and convenient that we’ve actually invested in two more for our home – one to store laundry detergent, and one to store bird seeds. They’re available in a wide range of colors including pink, brown, green, various shades of blue, grey, orange, red and white. You can select whichever color best matches your home’s décor. While doing the research to find the best dog food storage container tools, I knew that dry kibble diets aren’t for every dog . It’s up to you (and you should consult your veterinarian) what type of dog food you will feed your canine. Many dogs eat wet food diets or they get wet dog food mixed in with their dry kibble. If that’s the case in your house, you need to take extra care to make sure that any leftover canned dog food is stored correctly. There is a “best by” date printed on each can of wet dog food, and you need to make sure to use the contents by that date. If you open a can of food and don’t use the entire thing, it should be properly covered and stored in the refrigerator. You’ll need to use the leftover wet food within 2-3 days, or it may spoil and make your dog sick. SPOT Pet Food Can Covers work much better than cellophane or aluminum foil. They form a tight seal around the top of the can to lock in freshness and prevent air from spoiling the wet dog food. These lids have an interior lip that will fit smaller cans with a 2-7/8 inch opening, and the larger lip will fit cans with a 3-5/16 inch opening. They are perfectly sized to fit almost any pet food can. These lids are great for cat or dog food, and they can even be used on canned goods that you use in your kitchen. Many consumers commented on the fact that when they aren’t being used for dog food, these lids work great to cover cans of evaporated milk or pasta sauce. These can covers are made by Ethical Pet, and they provide a tight seal that not only protects the food from bacteria, but also prevents odor abortion to keep the food tasting fresh. Multi-pet households often require more than one pet food container. 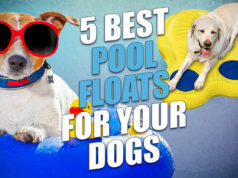 You may have a puppy and a senior dog that require different diets , or you may have cats and dogs, and need different pet food storage containers for each type of food. If that’s the case at your house, you should consider purchasing stackable food containers. They easily stack on top of each other to save space, and it gives you the convenience of having all your pet food stored in the same area. After a lot of research and reading comments from consumers, I found the best stackable dog food containers to be Vittles Vault Stackable Containers from Gamma2. The number of dogs that you have, and your dogs' sizes will determine the amount of dog food you purchase at a time. That’s why these containers come in 25-pound, 40-pound, 50-pound and 60-pound sizes. These are also airtight containers for dry dog food, like the IRIS container that I chose as my top pick. The twist on lid keeps the pet food dry, fresh and pest free. The lock-down double gaskets and efficient storage shape make these containers ideal for storing kibble in small spaces like pantries, closets or cupboards. They are also equipped with molded handles making them easy to lift and move. Vittles Vault Stackable Containers from Gamma2 are made from heavy duty plastic that will last for decades. They are made from high density polyethylene, FDA approved food grade plastic. They are also BPA free. The tops and bottoms of these storage containers are designed to nest together, but the company recommends that you only stack them two levels high. You should always stack the heaviest container on the bottom for safety reasons. Storing your dog’s treats correctly is just as important as properly storing his dog food. After combing through dog food storage reviews, reading manufacturer websites and browsing through the hundreds of different doggy treat storage options on the market, I believe the Yummy Paws Plastic Airtight Pet Treats and Food Canister is the best option available. If you have a toy breed and you don’t use much dog food, you could use this product to store dry kibble, but it only holds 4.4 cups of food or treats. The easy open, twist lid locks are 100% airtight to keep the contents of the container fresh and pest free. These containers are BPA free also, and they are stain, shatter and odor resistant. They are decorated with a paw print design to add a little fun to your home’s décor. These canisters are perfect for keeping treats on hand on a counter, end table or in a convenient cupboard. They are ideal for storing dog training treats as well. 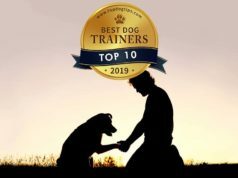 You can fill them with training treats, and either leave them in a convenient spot in your home, or easily take them with you outside or anywhere else your training adventures may take you. The Yummy Paws Plastic Airtight Pet Treats and Food Canister comes with a lifetime warranty from the company. Consumers rave about these canisters. Many pet parents that purchased this product state that the seal is strong and keeps the treats fresh for weeks. They are only available in red or black, but that didn’t seem to bother too many consumers. They also liked the ease of the screw on/off lid and the wide opening. It’s important to bring necessary pet supplies with you while traveling with your dog, and food for your Fido is definitely not something you want to forget. The Gamma2 Pet TRAVEL-tainer Bowl is a great tool to make packing your dog’s dry kibble much easier. This no-spill container is equipped with an easy-carry handle. When you remove the handle, you can pull off the food and water dish. Inside is a clear six plus cup container that can be filled with kibble. You can fill the bowls with dog food and water to let your dog have a snack on the road or bring this product with you to provide nourishment for your dog in a hotel room or at a family member’s home. Wherever you’re going, whether indoors or outside, the Gamma2 Pet TRAVEL-tainer is a fast and convenient way to bring dog food along for your Fido. The colored (blue or pink) bowls are dishwasher safe, but the clear plastic container needs to be washed by hand. The product offers an air-tight seal and is made with human food-grade plastic. Each bowl can hold up to 3 cups of food or water, and the compact design makes it easy to store in the car, in a backpack or in a purse. The entire compact system, when condensed, measures only 7.3 X 6.4 X 5.5 inches. Many customers commented on the size of the handle. They were impressed that it is big enough for people with large hands to carry comfortably. Typically, products with a compact design have a compact handle, but that isn’t the case with this travel dog food storage container. Can dog food storage improve my dogs health? If you buy more than one serving of dog food for your pet at a time, you really should consider purchasing products to aid in storing the excess food so it doesn’t spoil. Leaving dry kibble in the bag, even if the top is crumpled down or clipped closed, leaves the food exposed to air and the moisture in the air. It can cause the food to spoil in a very short time, and then you’ll have to throw it out and waste the money you spent. Wet food can spoil very quickly as well. Cellophane and aluminum foil are not the best alternatives for covering an opened can of wet food. Neither choice is airtight, and the dog food will dry out and can be exposed to bacteria. If you don’t store your dog food in an airtight container, it can also absorb odors that will change the taste of the food and could cause it to become unpalatable to your dog. You’ll end up throwing it out and wasting even more money. Do what I did: spend a little now on the best dog food storage and save yourself a lot of wasted money down the road. If you do decide to purchase some type of dog food storage container, be sure to consider the type of dog food you purchase and the quantity that you typically buy. You don’t need to spend the money on a large container if you only have a toy breed and buy your dog food 15 pounds at a time. Likewise, if you have multiple large dogs, it wouldn’t make a lot of sense to buy a small dog food storage container that only holds 20 pounds of dog food. You’ll also need to be sure that you buy a product that is specifically made for food storage. Find one that is made with BPA free plastic , and preferably one that is made with human grade material. The FDA guidelines aren’t extremely strict, but you should still purchase a container that is FDA compliant . My primary concern is usually that if I don’t purchase a high quality container, some of the toxins from the plastic may leach into my dog’s food. Honestly, not too much. I’m certainly not an expert in plastics or pet products. However, I’ve been writing and reviewing dog products on Top Dog Tips for more than a year, and during that time I have read countless articles on dog food contamination, the dangers of plastics for dogs, and how bacteria and mold on dog food can have serious effects on a dog’s health. I’ve also been a dog owner my entire life, and unfortunately, I have learned the hard way that it is better to find the best dog food storage container than it is to waste money throwing out spoiled dog food. We used to keep our pet's food in a plastic bin that was not airtight until I opened it one day to find bugs crawling on the food. As a child, my family just kept dog food in its original bag, but we’d also find pieces of it in the back of cupboards and in random places that rodents had dropped it. The only way to protect your pet’s food from pests , and keep air and moisture from spoiling it, is to invest in an airtight dog food storage container. Every container on this list is relatively inexpensive (the most expensive sells for about $120), and you’ll save that in no time if you don’t ever have to throw out dog food again. As long as you do a little research and select a container that is safe for your dog, you won’t regret making this purchase. It might sound crazy, but yes – it can. Let me explain. When your dog’s food is stored in an airtight storage container it won’t spoil, become rancid or contain bacteria. If you don’t use a storage container, these things can happen, and if your dog were to ingest spoiled food, he would surely become sick. In a roundabout way, the best dog food storage container can be good for your dog’s health where it serves as a preventative measure. Most pet parents should invest in dog food storage containers. Every cat or dog owner will purchase pet food, don’t they? So, why wouldn’t you buy a product to store the extra food in to make sure it's properly sealed? A select few pet parents may purchase wet food or raw dog food in single serving sizes, but most pet parents feed their dogs dry kibble and buy more than they will use at one time. Whether you purchase your dog food in 5 pound bags or 50 pound bags, you’re going to need a proper place to store all those leftovers. If you just do a quick internet search for best dog food storage containers, you’ll quickly realize that the selection is endless. It definitely wasn’t easy to narrow my choices down to the top ten best dog food storage options. I immediately disregarded all the containers that were made with poor quality materials, harmful plastic or manufactured by companies with a less-than-stellar reputation. That still left hundreds of dog products to choose from, so now what was I to do? The products that made this list had to do what they were supposed to do. I culled through blogs  and consumer reviews  to find out exactly which products would keep dog food fresh and pest free. I figured out pretty quickly that any product that was meant to store dry kibble or dog treats needed to be airtight. That is the only way to keep 100% of the moisture in the air out of the container. Then I had to look at products for other types of dog food, because every dog has a different diet. I needed to include products for wet food, dog treats and even for the times of traveling with dogs. This list needed to be comprehensive, so I couldn’t leave any stone unturned. After breaking the research up into categories, I was finally able to select the top ten best dog food storage products available on the market. I did all my research online through consumer reviews, articles and blogs from experts in the pet industry and manufacturer’s websites. I started by researching the importance of safely storing different kinds of pet foods, and what the dangers are if you don’t store them properly, according to multiple studies. Then, I needed to find out what qualities to look for in dog food storage products. I found advice  from veterinarians and experts in the pet food industry about what to look for when you purchase a dog food storage container. Once I knew exactly what to look for, I began searching: weeding through hundreds of products, and sifting through countless dog food storage reviews. I had to look at the product features and how much dog food they could hold. I also checked to see what each product was made of. Were they durable and were they safe? Was the container air tight? What type of plastic is it made of, and what's its quality? It was easy to narrow it down to the top 25 or 30 products, but then I had to make the final cut. I broke my search down into categories in order to make my final selections. That’s when I began digging deeper through dog food storage reviews from more consumers. Some of these products looked great online, but how did they perform in real life? If these dog food storage containers didn’t work the way the manufacturer said they would, I could not recommend them. The IRIS Airtight Pet Food Container Combo Kit met all the qualifications that I was looking for, and dog owners gave it rave reviews. I loved that it came as a kit with the large container, the travel/treat container and the scoop. I don’t like buying products just to have to turn around and buy something else to go with it. The fact that all of these items came together in a package for a reasonable price was a great bonus for me. I knew my top product had to be airtight. First of all, that’s the only way to ensure that moisture and air won’t spoil the food. It’s also the only way to be sure that your dog won’t be able to smell the food through the container. We have a Labrador puppy, and in true Lab fashion she is a bottomless pit when it comes to food of any kind. I knew if the dog food container was airtight then she wouldn’t be able to smell the kibble, and hopefully she wouldn’t tip the container over and try to get into it. We’ve had it for about 3 weeks now, and she hasn’t even tried to sniff it! As she gets older, she may begin to associate the container with food and become curious, but for now it doesn’t seem to pique her interest at all. I especially love the wheels on this dog food storage container! We leave this container tucked in the corner next to our dogs’ food dish. When it’s time to fill it up, we can easily wheel it out, fill the bowl and wheel it back where it belongs. The lids of the containers flip open easily, and the openings are large and offer plenty of space to maneuver the scoop. Simple products are the best in my mind. The IRIS Airtight Pet Food Container Combo Kit makes the life of a pet owner just a little easier. It has a simple design that fixes a common problem – how to store dry dog kibble safely . It’s so easy to use that our four-year-old son has no trouble with it at all. Since it’s on wheels, he can push it all by himself, and now he’s the one in charge of feeding the dogs in our house. Most importantly, this best dog food storage container is well made with products that are safe for food storage. As pet owners, we go above and beyond to make sure our cats and dogs are healthy, and that we provide them with quality nutrition. However, sometimes we fail to think about the containers that we keep their pet food in. If your dog food storage container is made with cheap plastic, some of the chemicals from the plastic can leach into your dog’s food. You could spend extra money to purchase a high-quality food, only to contaminate it yourself by storing it in a poor-quality container. Consumers can’t get enough of this product. At the time of this writing, over 1,750 buyers have reviewed it on Amazon, and it is currently holding a 4.5 out of 5 star review. Pet parents who have purchased this dog food storage container have complimented its durability and they are impressed with how fresh it keeps their pets' foods. Its ease of use is mentioned often in reviews, and buyers are also impressed with its holding capacity of more than 25 pounds. Daisygirl: Works for me_ (March 20, 2014. Read the full review.) I was able to slide a 30 pound dog food bag into the bottom section. I did not want to dump the food out into the container so I was glad it fit. I love the top for treats and it slides in and out of the corner easily. It is better than the dog food bag always sitting on the kitchen table chair. However, mine did not come with the scoop. But I did not plan on using it anyhow. Oh, it also arrived in fine shape, no cracks or breaks. If you’ve got a multi-dog household like ours, you may buy your dry kibble in quantities larger than 25 pounds. If you purchase 40 or 50 pounds at a time, you could consider getting two of these units. You could also fill the large and small container with food instead of using the small one for treats. You’ll be able to fit more than 35 pounds of dog food in it that way. As I previously mentioned, a meddlesome dog may be able to get into this container fairly easily. However, since it is airtight, your Fido won’t be able to smell the food so it shouldn’t entice him. If your dog does learn to associate the container with food, you may just need to put it away in a closet or cupboard. Due to the containers size, this shouldn’t be hard, and since it’s on wheels it would be very easy to move back and forth when you needed to fill your dog’s dish. Many dog owners use wet food to provide their dog with a balanced diet, and I needed to include storage for wet food on my list too. As I mentioned earlier, cellophane and aluminum foil do not provide an airtight seal, and that’s how bacteria can get into canned dog food. These bacteria will sometimes cause mold that you can see, but not always. If you don’t cover an open can of dog food with a lid like these SPOT Can Cover Lids, you run the risk of exposing your dog to bacteria that can’t be seen. Unlike other similar products for covering your dog's canned food, these lids have two lips so they can fit virtually any canned product. They also come in a pack of three, so if you have multiple dogs that eat wet food, or you like to alternate flavors for your pet, you can have up to three cans open at a time, and they will all be protected. Many consumers also mentioned in their reviews that other similar products crack and dry out after time, but these can covers last for a long time and still keep the food just as fresh as they did on day one. The products that I have included in my list so far are great, but they aren’t the only excellent dog food storage containers on the market. For example, Remington also makes an airtight pet food storage container that utilizes an airtight foam seal to keep the contents fresh and free of pests. This dog food storage container comes in many different sizes to hold 25-45 pounds of dry kibble, and it is also on wheels. The Remington Airtight Pet Food Storage Container is clear as well, making it easy to see when the dog food inside is running low. It’s got the same type of molded-in handle latch that my top pick IRIS container has. It’s simple to unlatch to gain easy access to your pet’s food, and closes securely so you don’t need to worry about rodents and bugs getting into the dog food. One of the best things about using this type of airtight container is that it can be kept inside or outside. If your dog lives in an outdoor kennel, you could easily store this container outside next to his kennel and it would keep animals, pests and the elements from ruining his food. It’s also great if you live in a very humid climate. OXO Good Grips Storage Containers also make my list of the best dog food storage containers. These come in many sizes, so they could be used to store dry kibble, and you could purchase a smaller size to store dog treats as well. These containers are designed with a unique push-button mechanism built in to the lids. They provide an airtight seal with the push of a button. Push the button again and the lid releases and pops up to give you a handle to lift with. When the button is pushed in and the container is sealed, the top is flat. That means you can buy multiple OXO containers and stack them to make extra room in your kitchen, closet or cupboard. If you feed your pets an assortment of treats, you could buy multiple containers and keep each type of treat separate without taking up a lot of space. Another of the best dog food storage containers is the Bergan Stak-N-Stor. As its name suggests, these containers can also be stacked to save space. They are ideal for multi-pet families that may need a container for cat food, dog food and treats. These containers come in three sizes: 9 gallon, 18 gallon and 24 gallon. They are made from durable, high-density polyethylene, meaning they are rust and dent proof. These can also be used indoors or outside. Stak-n-Stor containers from Bergan are the best choice if your dog tries to break into pet food containers. All sizes of these Bergan containers will accept a lock, so you can keep even the most food-obsessed dogs at bay. They are also ideal for outdoor food storage, as wild animals will not be able to break into the locked container either. Although these containers are not airtight, they are made with FDA compliant materials, and they are also BPA free. Bergan Stak-n-Stor containers are also made in the U.S.A.
Another excellent choice for pet food storage is the Stainless Steel Pet Food Storage Can from simplehuman. These are designed with a robust, lock-tight handle that keeps food fresh and pets out. A silicone gasket is used to create an airtight seal that prevents food from going bad. This storage bin also includes a scoop, like the combo kit from IRIS, and it attaches magnetically under the lid. This container can hold up to 45 pounds of dog food. The Stainless Steel Pet Food Storage Can from simplehuman has a slim design, which allows it to fit into tight spaces. It is also equipped with a removable, BPA free inner bucket that makes for very easy cleaning. Built-in rear wheels allow you to easily move the container, and the fingerprint-proof finish resists smudges to leave the stainless steel looking shiny and clean. It also comes with a 10-year manufacturer’s warranty. These additional products are in no specific order. Just because the Ultra Kibble Keeper from PetMate is last on my list does not mean it isn’t one of the best dog food storage containers. These containers are sold in 10-pound, 20-pound and 40-pound sizes. They are made of durable plastic and contain Microban anti-microbial protection that eliminates smells, stains and bacteria. The 40-pound container comes with its own scoop that attaches under the lid. Each of these containers from Petmate also offers a translucent design that allows you to see how much food is left inside. Another convenient feature is the inset handle on the bottom of the container for easy pouring. Consumers really enjoyed the hinged lid. They said that it opened effortlessly and the locking mechanism is easy to use. Most pet food storage containers are made from plastic. In recent years, researchers have begun to realize that some plastics are full of toxic chemicals. Many studies have been done on the harmful effects of these toxins on humans, but there are not as many on the health effects that these plastics have on pets. It is safe to say that if they are dangerous for humans, they probably aren’t safe for dogs and cats either. When you store your pet’s food in containers made from unsafe plastics, some of the toxins can leach into your dog’s food and he will ingest them. BisphenalA, also known as BPA, is one of these harmful toxins. There are others as well, and as more research is done, I’m sure we will see more come to light. In the future, there will probably be tougher restrictions placed on products made from plastic. Whether restrictions are mandated by the government or not, we’re sure to see dog toys, dog food storage containers and other products for pets made from plastics becoming safer. You can already see labels stating that products are BPA free on every pet store shelf, but in the future you will probably see even more. We may even see a day when it is illegal for companies to use plastics that contain BPA to make products for humans or animals. Your dog’s safety is your number one concern as a pet parent. You protect him at all costs. Setting up fences to keep him safe in your yard, keeping him on a leash so he stays safe while you travel and securing him in your vehicle with a harness are all great ways to keep your Fido safe. I’m sure you’ve given a lot of thought to the kind of food that you feed your dog too. Food safety is one of the biggest worries of pet parents. With all the recalls happening lately, it’s nerve wracking to select a top-quality food that is manufactured by a trustworthy company. Then when you bring the dog food home you need to be sure that you store it properly or it could spoil and still cause your dog to get sick. Buying an appropriate dog food storage tool for the type of pet food you purchase is essential in keeping your dog healthy. The best dog food storage containers also save you money, because you won’t have to throw away spoiled or stale dog food ever again. These containers can be used to keep pests and bugs out of your dog’s food, and they can also be used to keep your pet from getting into stored food and eating too much. The BPA Controversy: Can a plastic really make you sick? Photos of IRIS Airtight Dog Food Container and the video review of best dog food storage container by Samantha Randall. All rights to content are reserved.